An unforgettable Spaghetti Western presented in high definition for the first time. From Western legend Sergio Leone (The Good, the Bad and the Ugly), the film stars Terence Hill and Henry Fonda and is directed by Tonino Valerii. Music is by Ennio Morricone. Image Entertainment, an RLJ Entertainment (NASDAQ: RLJE) brand, announces the release of My Name Is Nobody (40th Anniversary Edition) , an unforgettable Spaghetti Western presented in high definition for the first time. From Western legend Sergio Leone (The Good, the Bad and the Ugly), the film stars Terence Hill (They Call Me Trinity) and Henry Fonda (Once Upon a Time in the West) and is directed by Tonino Valerii (Day of Wrath, My Dear Killer). Music is by Ennio Morricone (A Fistful of Dollars). 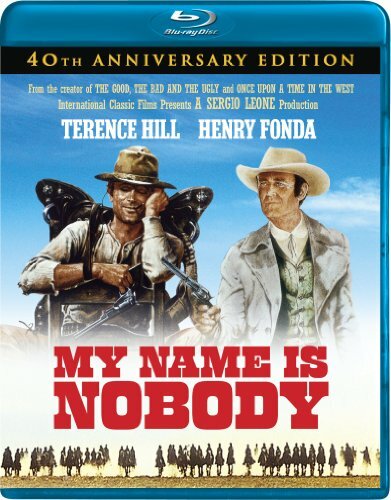 My Name is Nobody: 40th Anniversary Edition is available for the first time on Blu-ray for an SRP of $24.98 on Nov. 5, 2013. From western legend Sergio Leone (The Good, the Bad and the Ugly) comes a rollicking shoot-'em-up! Young, ambitious gunman Nobody (Terence Hill) sets his eye on his idol, gunslinger Jack Beauregard (Henry Fonda) who's intent on sailing off into retirement. Deciding his hero should go out with guns blazing, Nobody sets him up for a showdown with a pack of the deadliest bad guys in the West, triggering an unforgettable finale that's become an action comedy legend! Now available in pristine high definition, this is the definitive collector's edition of this classic western. RLJ Entertainment, Inc. (NASDAQ: RLJE) is a premier independent licensee and distributor of entertainment content and programming in North America, the United Kingdom and Australia with over 5,300 exclusive titles. RLJE is a leader in numerous genres via its owned and distributed brands such as Acorn (British TV), Image (feature films, stand-up comedy), One Village (urban), Acacia (fitness), Slingshot (faith), Athena (documentaries), Criterion (art films) and Madacy (gift sets). These titles are distributed in multiple formats including DVD, Blu-Ray, digital download, digital streaming, broadcast television (including satellite and cable), theatrical and non-theatrical. Via its relationship with Agatha Christie Limited, a company that RLJE owns 64% of, RLJE manages the intellectual property and publishing rights to some of the greatest works of mystery fiction, including stories of the iconic sleuths Miss Marple and Poirot. And through its direct-to-consumer business, RLJE has direct contacts and billing relationships with millions of consumers.